Sometimes something really great comes out of needing to make a meal when you didn’t think you’d need to. That’s where this sandwich comes in. 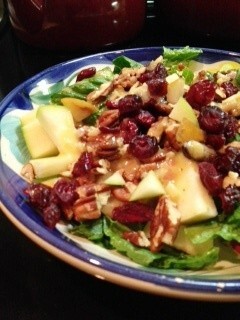 It was so very very very tasty and so many different layers of flavor!!! And mmmmmmmm melty cheese. I had plans for Saturday which, super-sadly, fell through due the weather being awful. Torrential rain, dangerous winds etc.. I watched the figure skating championships instead. I can’t wait for the Olympics to start in February-figure skating is probably my favorite of the winter sports. Remember that whole Nancy Kerrigan thing years ago? Lifetime made a really great (well as far as a Lifetime movie goes) about that and boy did they make it dramatic and fun to watch. I think we have some great contenders for medals this year. 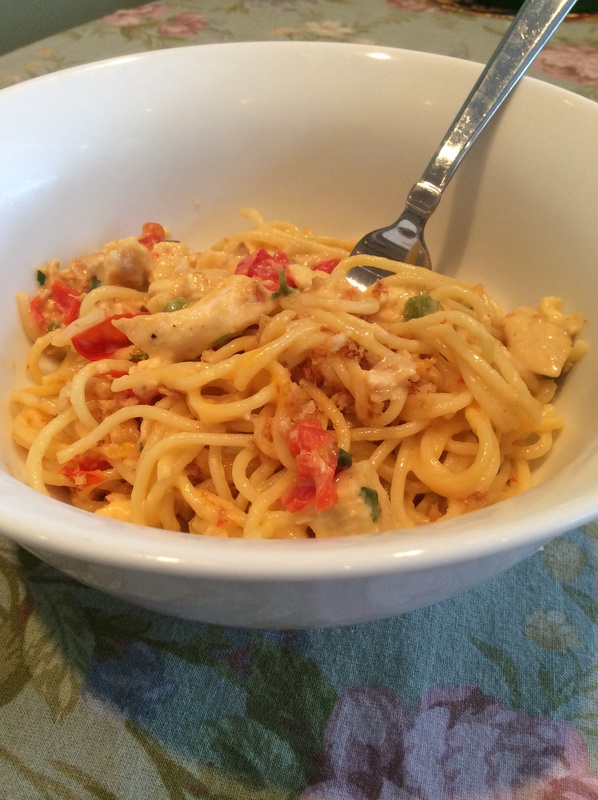 I always have boneless, skinless chicken breasts frozen individually in the freezer. I buy the large family packs (they’re FAR less expensive than the 1lb packs), I bring it home, trim up the chicken, weigh it and then use my food saver to package it up. I write the date and weight on the package. Those are lifesavers on nights when you want to make something fast. In a bowl of cold water the chicken only takes a short time to defrost. Sprinkle chicken with seasoning, salt and pepper. In a small skilled over medium high heat heat up the 1 tsp oil and then add the chicken breast. Cook a few minutes on each side until fully cooked. Remove from the pan. Chop into very small pieces and set aside. Microwave the flatbread for a few seconds to loosen it up. Brush a thin layer of the remaining olive oil onto the flatbread and then turn it over so that the oil side is down. Smear the pesto onto one half of the bread, then lay down the cheese then top with the peppers and chicken. Fold the top of the bread over and gently press to make sure it’s all staying together. Place it on the panini press and cook until cheese is melted and bread is crisp. I love the egg sandwiches that we get at delis and bagel shops (having such great delis and bagel places here on Long Island I get spoiled) but making them at home is easy too-and better for you since you can control the ingredients and skip the butter and extra grease. I’ve heard from people visiting (the NY metro area) that egg sandwiches don’t exist where they live. They have my full sympathy. I can’t fathom life without great delis, bagel shops and pizzerias. Here we get them on bagels or on kaiser rolls. 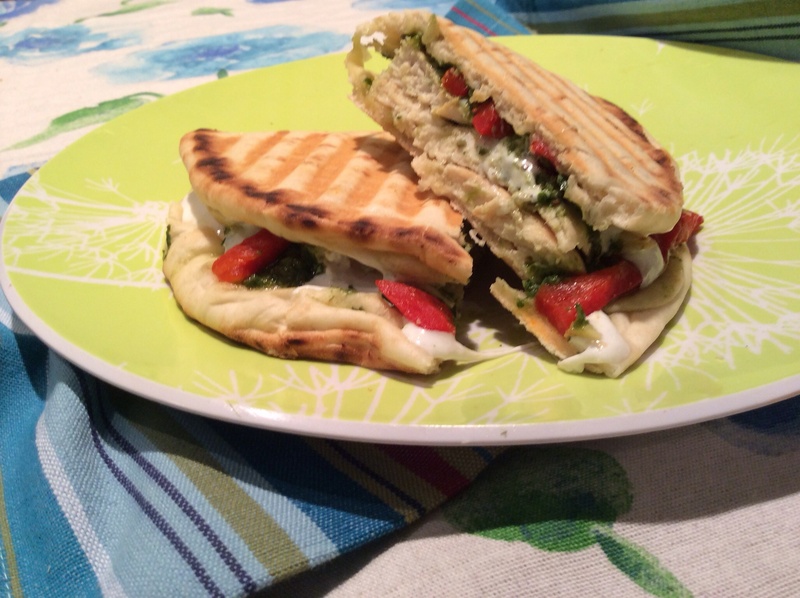 I didn’t have either but the flatbread in my panini press worked perfectly. They’re heaven. Feel free to use egg whites, egg beaters, bacon, different cheeses etc.. to make it your own. Some people put ketchup on it too but I don’t. 4 slices american cheese (we use the Boar’s Head brand. It melts differently than others and in my opinion has a nicer texture). Cook the sausage as to package instructions then set onto paper towels to drain. Chop into small pieces and return to paper towels and set aside. Microwave the flat bread for a few seconds to loosen it up. 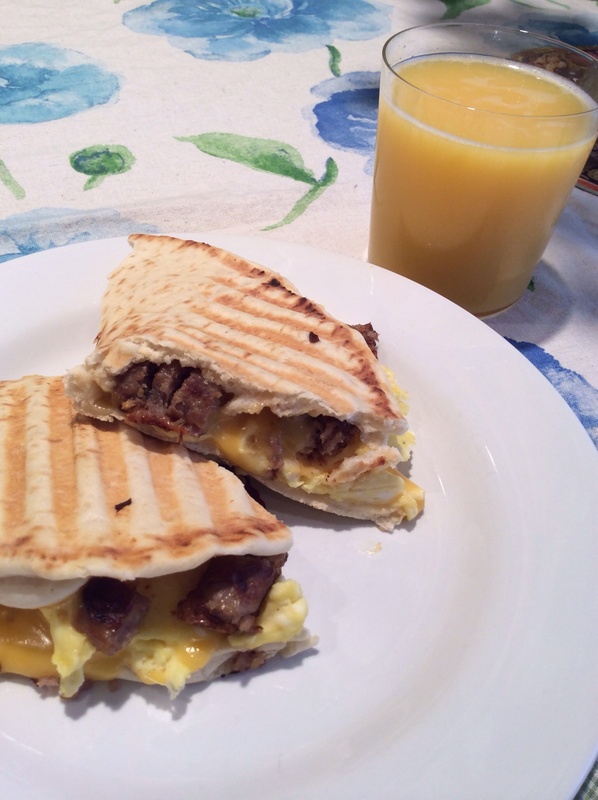 On one half of the flatbread place half of the cheese, eggs and sausage. Fold the other half of the bread over the top and place on the panini press until bread is crisp and cheese has melted fully. I’ve always had a thing for fondue. When I was young my Mom used to make it and it was always a treat. 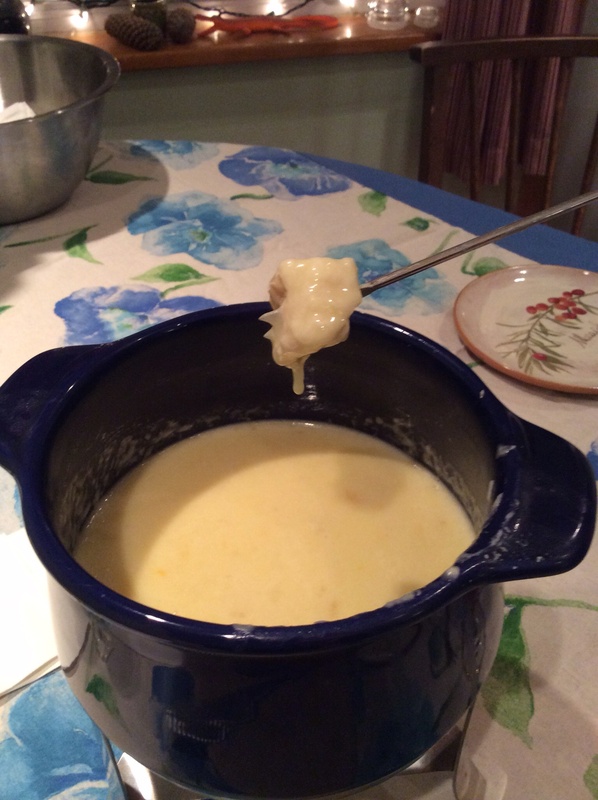 Melty cheese on a chilly night-perfect!! What’s not to love? I’d not ever made fondue from scratch but it was easy. If you can grate cheese you can make it. I’m not really all that big of a New Years Eve person–truth be told it feels like any other night to me but since others make a big deal about it well I might as well do something 🙂 New Year’s Eve this year was so nice! I made the fondue, Mom brought over lobsters, Grandma brought a salad. We played cards and ate delicious food and laughed our heads off. Thanks for holding that below Mom. french bread, granny smith apples etc.. all cut into small squares for dipping. Rub a medium sauce pan with the garlic. Add the wine, thyme bundle and lemon juice and bring to a simmer for a minute or 2. 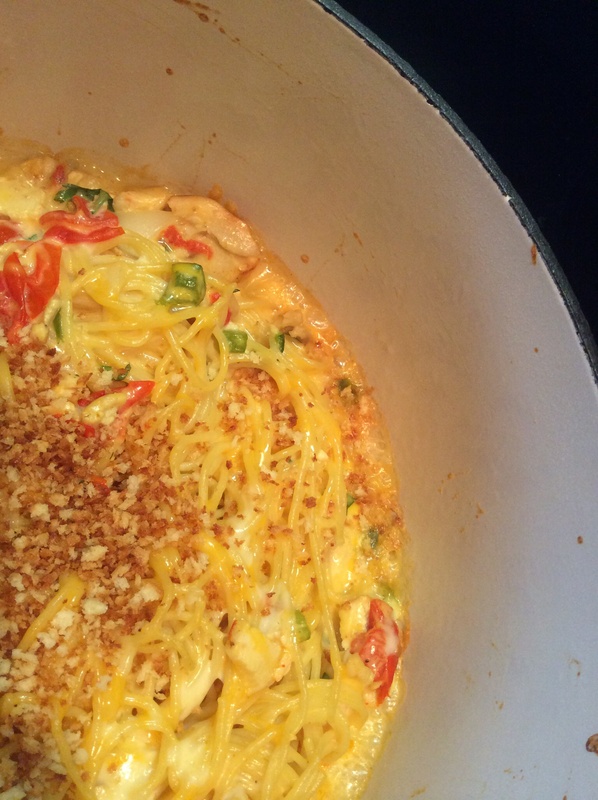 Combine the cheeses and flour in a bowl and mix to coat evenly. Add it to the wine mixture a bit at a time, stirring until melted and velvety. Pour into your fondue pot and place over the appropriate heat source. 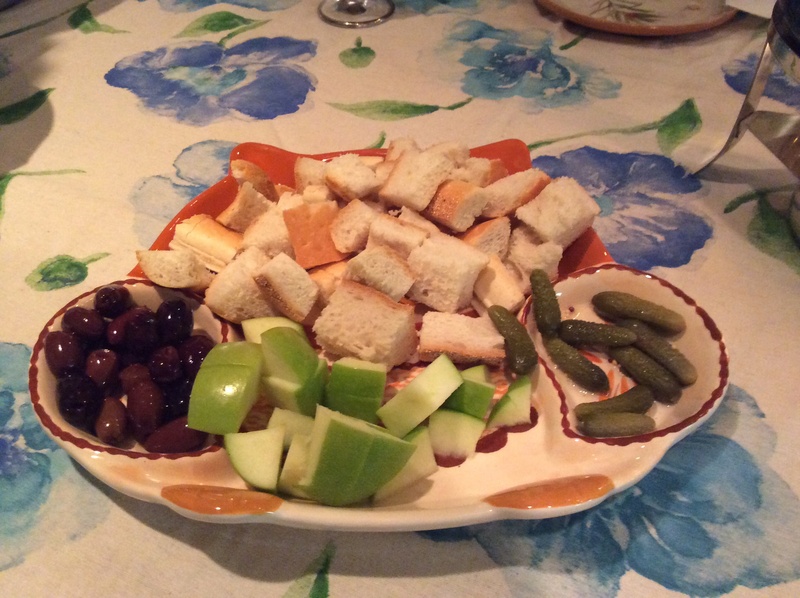 I put the bread and apples out with other small things to eat easily with the fondue fork but not to dip into the cheese-dill gerkins, kalamata olives. They were a nice addition to the plate. 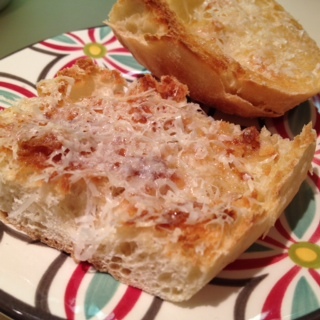 Often when I make pasta or soup I’ll make up some of this delicious crunch bread to have on the side. It’s great to eat plain or to wipe up the last bits of a bowl of soup or sauce. And it couldn’t be easier to make. You can use pretty much any bread. You need to use freshly grated parmesan though-something that you should keep on hand at all times anyway. Cut bread into the desired shapes and put into the toaster oven to toast very slowly. When they’re just a touch brown remove the bread and spread a bit of butter over the bread. Return to the oven and melt the butter. 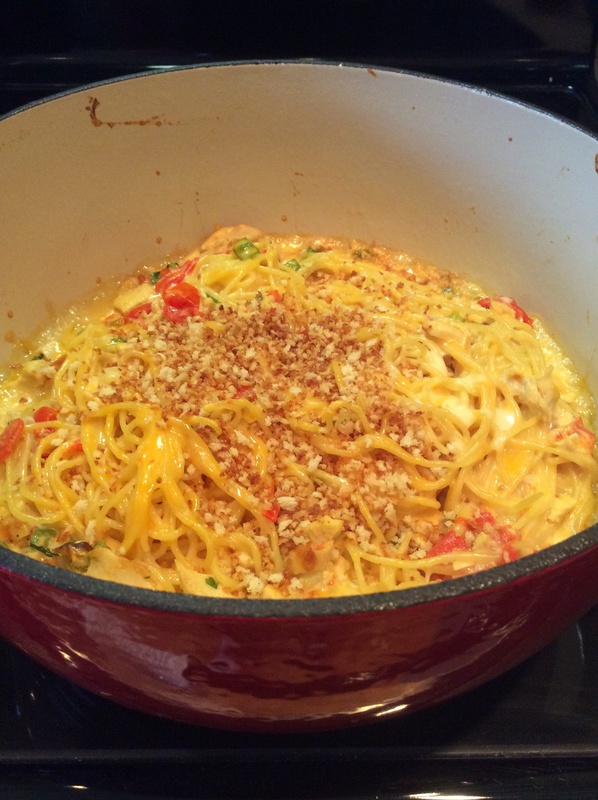 Remove and sprinkle the parmesan cheese and then put back in the oven for a few more minutes. Watch it carefully-parmesan burns quickly. Remove when just melty. I love green beans. I always have. When I was little I loved eating them raw and I still do. Now that I’m old enough to use the oven I also roast them. Roasting is my preferred method of cooking them too as I basically like them cooked through but still very crisp. As you can see in the photo below I grated some cheese on top. YUM! Could it be any easier? Cut each end off, throw them onto a baking sheet, sprinkle a little of this and a little of that and then **abracadabara** they’re done. The answer is ‘no’. It cannot be any easier. This recipe is a basic guide. Use your imagination. If you like spicy try a touch of hot sauce or cayenne pepper. Try other salts. Try other peppers. Use onion powder instead of garlic powder. Or just leave them plain. 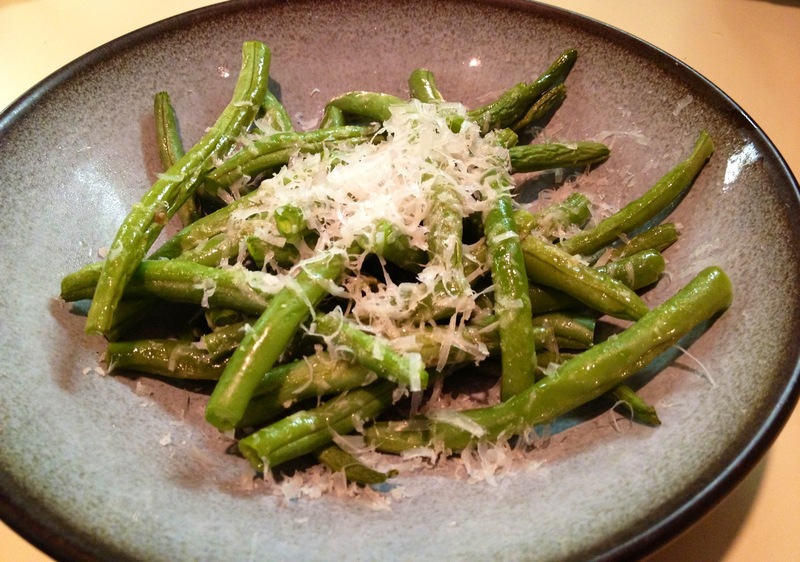 Green beans are totally fun. As many fresh green beans as you (and whoever else is with you) will eat, washed and ends trimmed and beans relatively dry. Spread beans on one layer on a baking sheet. Put them close together. Drizzle oil, salt, pepper and any other spices you like on them then toss with hands to evenly coast the beans with the oil and spices then spread them out evenly. Bake for about 10-15 minutes-until desired crispyness has been met. Put them on the plate or in the bowl and sprinkle with the cheese. Yes I know I thought the same thing when I read the name of the dish–YUM!! Putting 2 classics together-that’s genius! I’ve seen a few different recipes for this floating around the internet and blog world for a while but never got around to making one. For this month’s blog swap I was given http://www.tasteofhomecooking.blogspot.com/ and it took me a while to decide to make this dish-Sarah’s got a ton of great sounding recipes on her blog. I really did enjoy eating these yummy sandwiches. The recipe makes about 4-6 sloppy joes depending on how much you can load into the bun. 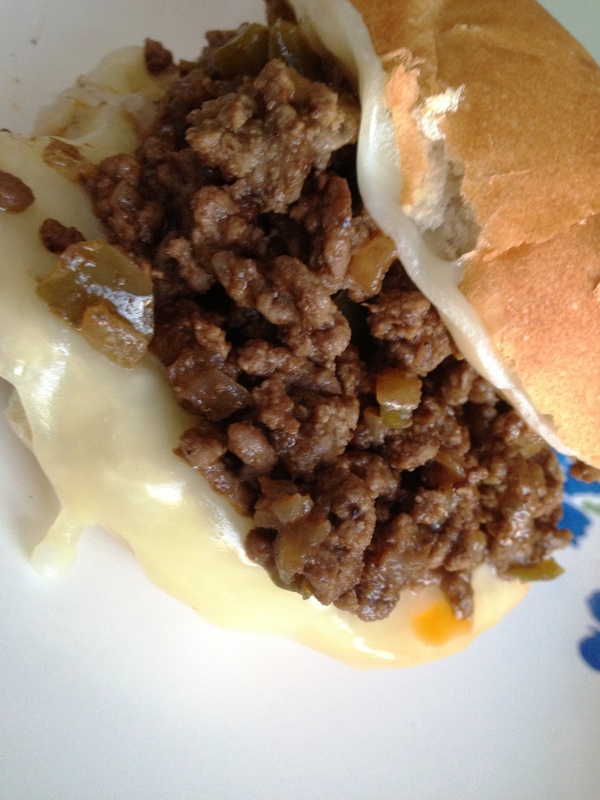 I toasted the roll with a slice of provolone on each side and then put the beef mixture in the middle. I stuck to her recipe pretty closely with this one-the only changes being that I added a bit of worstershire sauce and used less onion and upped the steak sauce amount and then let it reduce for a while. I think the green pepper added a great depth of flavor too. 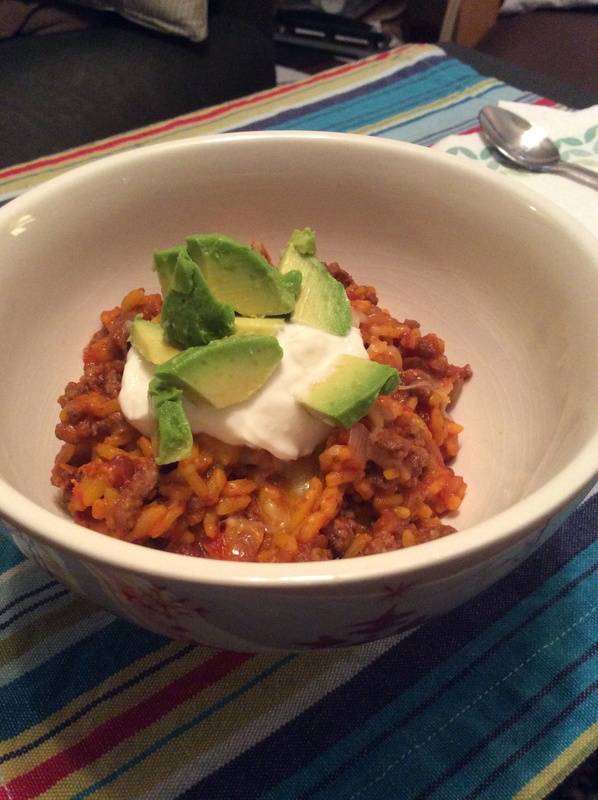 Next time I make this I will use the leanest ground beef that I can find to cut down on the fat. The beef mixture also reheated extremely well. Add the olive oil to a large skillet set over medium-high heat. when the oil is hot add the onion and geen pepper and cook until starting to brown and slightly soft. Remove the onions and peppers from the pan and set aside for later. To the same hot pan add the ground beef and brown, cooking through thoroughly. Drian any fat, add the peppers, onions and stir to combine. Then add the steak sauce, worcestershire sauce, beef stock. Bring it to a boil and then reduce heat and let it simmer about 10 minutes until most of the liquid is gone. Add salt and pepper if necessary to season. Cut the rolls in half, place one piece of provolone on each side and toast. Mound up the beef onto the rolls and either eat open face or as a sandwich. Check out the other May blog swap recipies here. Thanks for hosting Sarah!! Breakfast Burritos-make ahead and freeze!! For the last few weeks I’ve been thinking of making something for breakfast (other than just toting an apple to work) that I can make ahead, freeze and then just pull out and zap in the morning. It also has to be something that the Husband loves. 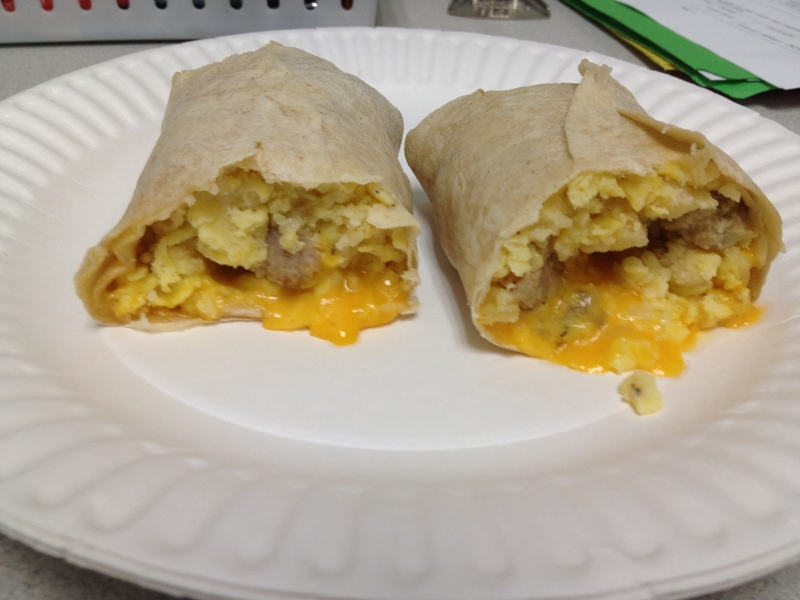 So I looked around at some online recipies and got an idea to make Breakfast Burritos. I used the recipies on line for only an idea of how to wrap and how long to heat up etc.. so this is my own recipe-and first try. I made them last night-took maybe an hour, and ate one this morning and it was delicious. This is a photo of the one that I ate this morning after I heated it up. In a large pan (it has to be large enough to hold all of the sausage, eggs and hash browns) cook the sausage and crumble into small pieces as it cooks. When it’s completely cooked remove from pan and place on a plate with paper towels to absorb the excess oil. In the same pan cook the hash browns as per instructions on the bag. While the hash browns are cooking crack all of the eggs into a medium bowl, add milk, salt and pepper to taste, whisk and set aside. When the hash browns are completely cooked add the sausage back to the pan and then add the eggs. Stir gently until the eggs are completely cooked. Remove pan from heat. Set one wrap on the counter and spoon about 1.5 cups of the eggs onto the left/middle of the wrap. Sprinkle with the desired amount of cheese. Fold the left and the right side of the wrap over the ends of the eggs, push the egg mixture in a bit and then roll towards the empty end of the wrap. ( It should be tightly wrapped-if not you didn’t push the egg mixture together enough or you put too much–dont worry it will still freeze it will just come out a bit. ) Place burrito on a length of plastic wrap and roll it along folding in the sides as you go. Place in freezer immediately. Repeat until all of the wraps or egg mixture is used up. To heat: remove from freezer and unwrap completely. Wrap it in a paper towel and put it on a plate in the microwave for about 2 minutes. At the end of 2 minutes turn it over and heat for another minute. Remove, cut in half, and heat for another minute or until it’s heated all the way through.